Dining out at Prime Cincinnati is always special: great steaks, great seafood, amazing side dishes. But now they’re upping their game for Cincinnati’s Burger Week! Burger Week is July 16-22 this year, and restaurants all over town will be offering burger specials for just $5 to tempt your palate – and Prime Cincinnati should be the first (and last!) stop on your burger tour of the Queen City. This year’s entry is the Jack Burger, a fantastic prime burger with arugula, aged Vermont cheddar, Berkshire Bacon, truffle aioli and the crowning glory: Jack Daniel’s infused bacon and onion jam, all served on a brioche bun. Get a Jack & Coke as part of their Jack Daniel’s special for just $7. Perfect for lunch or dinner, this burger is not to be missed! You can also enjoy the Jack Burger for lunch at their @580 Market Gourmet location, at 580 Walnut Street. While Burger Week is generally a one-week meat extravaganza, two restaurants in town were selected to continue on for an extra week, and Prime Cincinnati is one of them. From July 23-30 you can keep on enjoying that $5 Jack Burger; meat lovers are getting a summer bonus! 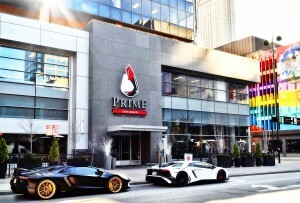 Prime Cincinnati will also be starting their new entertainment series in July, called the Prime Cincinnati Summer Series. Kicking off on July 20, join them at 9pm for the Cin City Comedy show, an exciting and hilarious improv group featuring alumni from Second City, Upright Citizen’s Brigade and The Groundlings. For more information and tickets, call (513) 579-0720 or go to primecincinnati.com. And Prime Cincinnati will continue to offer live music by local artists Thursday through Saturday nights. Don’t forget, Prime Cincinnati is a great venue for private events, both personal and business. Host a rehearsal dinner, a birthday party, a girl’s night out or perhaps a business meeting, corporate event or staff holiday party. Whatever your needs are, Prime Cincinnati is sure to have the perfect fit.